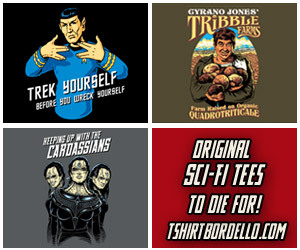 I don’t watch Star Trek: The Next Generation as often as I should as at most I will watch 2 or 3 episodes a week when it is on BBC America on Saturday afternoons, but I still love the show (DS9 is my favorite) and Geordi La Forge is definitely one of my favorite characters. 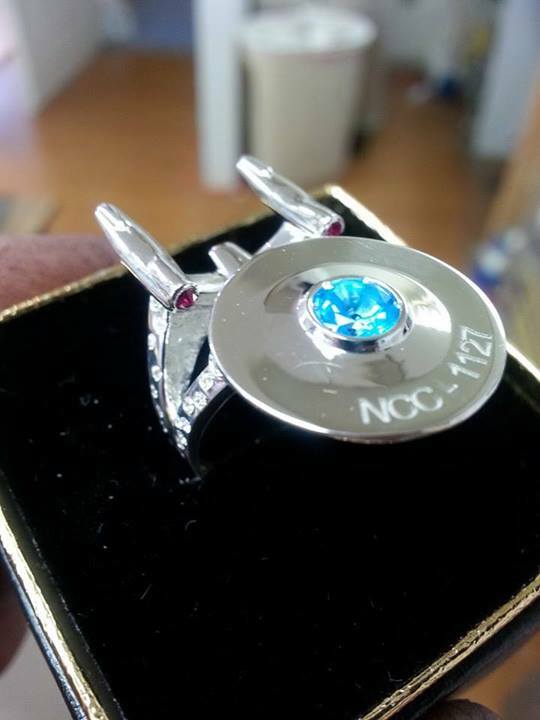 Knowing how popular he is and how iconic his VISOR has become, I had a feeling you guys would flip out over this awesome Geordi La Forge VISOR ring I stumbled across yesterday. 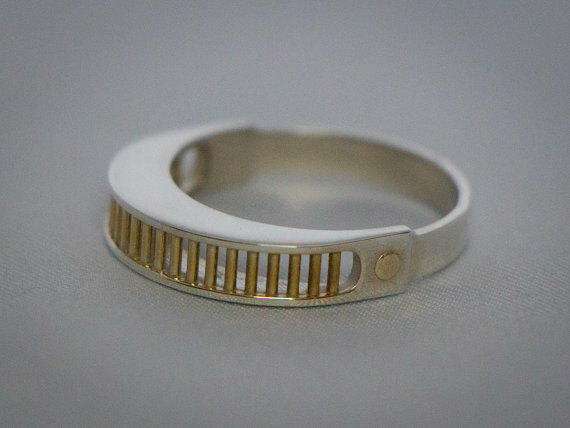 Etsy seller eyephoriadesign is selling this fantastic TNG inspired Geordi La Forge VISOR ring for just $69.99! 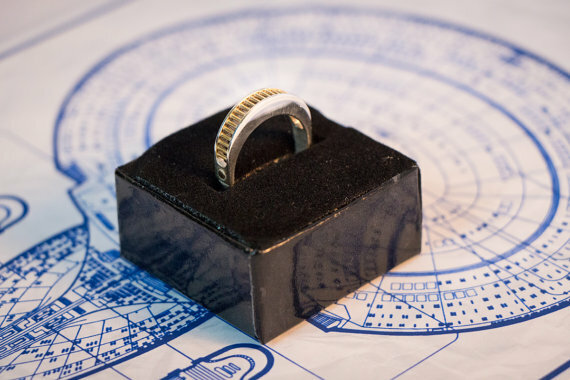 The ring is made of sterling silver with 24K gold plated accents and apparently it is made using some sort of 3D printing technology. 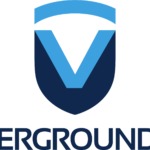 However, if dollars isn’t how you want to pay, the seller also accepts Bitcoin and offers a 5% discount when paying with it. Normally I probably wouldn’t mention something like that but this is the first time I have ever seen an Etsy seller accept Bitcoin as payment. 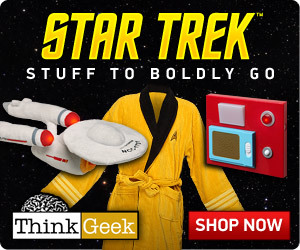 If you are looking for a new ring and you happen to be a big Star Trek: TNG fan, then this is the ring you have been looking for! It never ceases to amaze me just how romantic some geeks can be and the lengths they will go to when they propose to that special someone in their life. 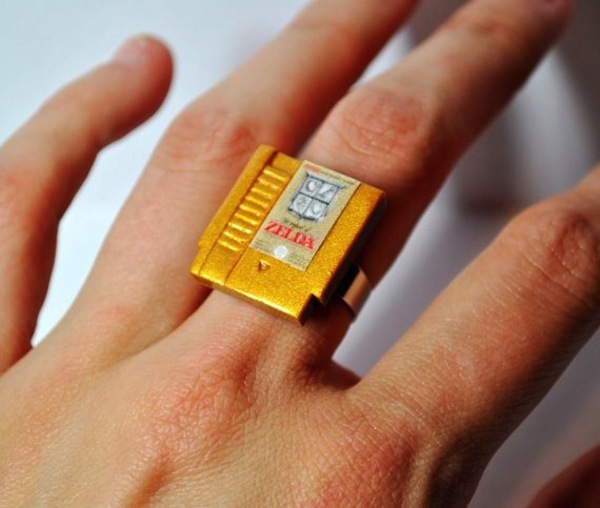 I’ve seen elaborate proposals and some pretty cool rings and this definitely qualifies as a pretty sweet engagement ring! 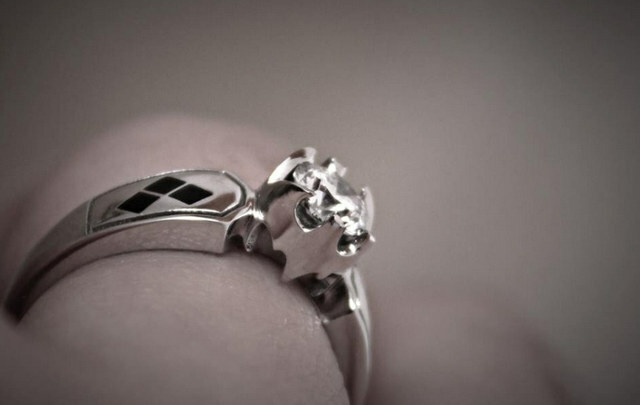 In the past, I have featured a cool Portal Companion Cube engagement ring and an absolutely stunning Legend of Zelda engagement ring but when it comes to simple, classy and elegant, this Batman and Harley Quinn ring is perhaps my favorite. This awesome Batman and Harley Quinn ring was designed by Daniel Maffett for his fiancée and made by Tom Sayers of Sayers Jewelers. 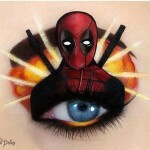 The design is very well done in my opinion and I love the end result! Here is what Daniel had to say about the ring and his proposal. “My goal going into this design was to create a ring that was traditionally elegant and sleek but represented my fiancé and I. Comic books are a big part of us and her favorite is obviously Batman and her favorite character is Harley Quinn,” says Daniel. Delivering the ring was the couple’s dog who proudly carried it in a sack of coal to Daniel’s fiancé. Congrats to Daniel and his bride to be! Share this with any Batman and Harley Quinn fans you know! 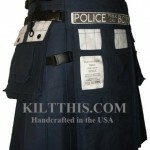 Like Fanboy Fashion on Facebook too! In the past, I have made mention of the fact that I am not one who cares for wearing rings. In fact, it drives me crazy! 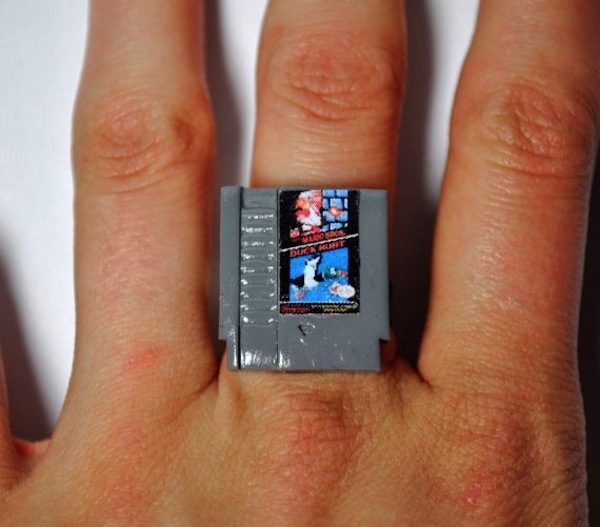 I’d be lying if I said that I’m not a little worried about ring wearing thing if I ever get married some day. I suppose I could do like the awesome couple below did but I’m not sure I am any more fond of the idea of getting a tattoo either. However, I think this couple did come up with a pretty cool ring tattoo idea. 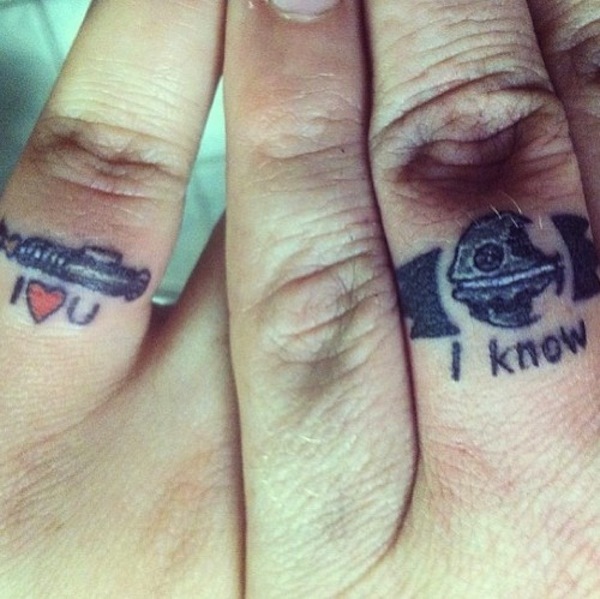 Unfortunately, I’m not sure who the awesome and super geeky couple is whose hands are in the picture below but I think they may have found the ultimate way for one Star Wars fan to show another Star Wars fan just how much they love them. These awesome Star Wars tattoo rings feature the iconic lines from Han and Leia right before Han is frozen in carbonite and they even feature a lightsaber and the Death Star. This couple definitely hasn’t been looking for love in Alderaan places. I have been a big Star Trek fan most of my life and I think I would have to say my favorite alien race on the show has to be the Klingons. While I don’t share their taste in food (I prefer my food to not be moving when I eat it) I have been known to curse in Klingon on occasion and have the dream of having a Klingon wedding one day. With as much as I like the Klingons, you would think I would be reaching for my credit card at the sight of this awesome Klingon ring below. However, not being a fan of jewelry, I think I am going to pass. However, if you like wearing rings and love Klingons, I suggest you get one! 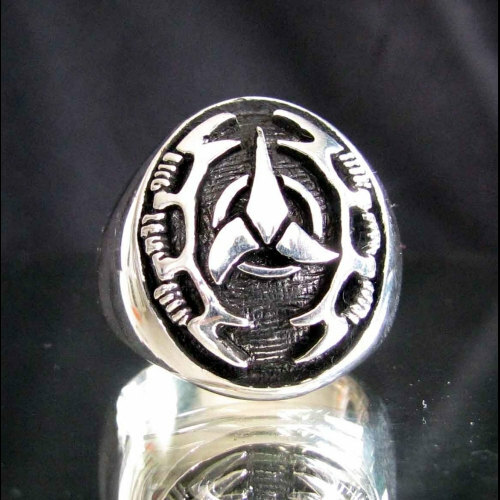 Etsy seller Sterling925Silver is selling this awesome Star Trek Klingon Imperial Coat of Arms Bat’leth ring for $86. 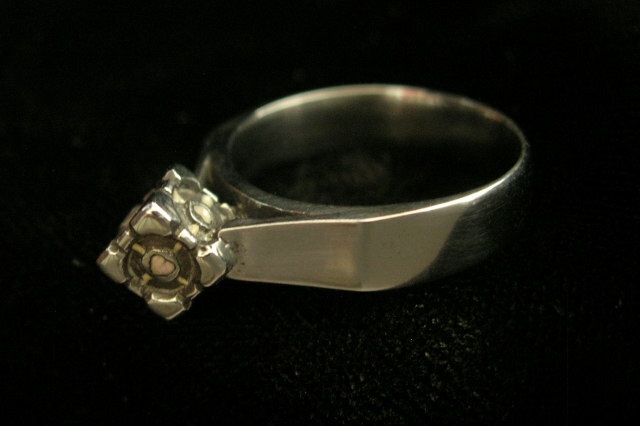 This Klingon ring is handmade from sterling silver and you can get it in sizes 4-16. No Klingon warrior should be without this ring! When it comes to geeky engagement rings, I have seen a bunch of them ranging from the Doctor Who’s TARDIS to one that looks like the Stargate from the Stargate shows, but nothing quite says will you be my companion for the rest of my life quite like a Portal Companion Cube engagement ring! The clearly awesome folks over at bmf jewelry have posted a bunch of pictures of how this awesome Portal Companion Cube engagement ring was created over on Custom Made. 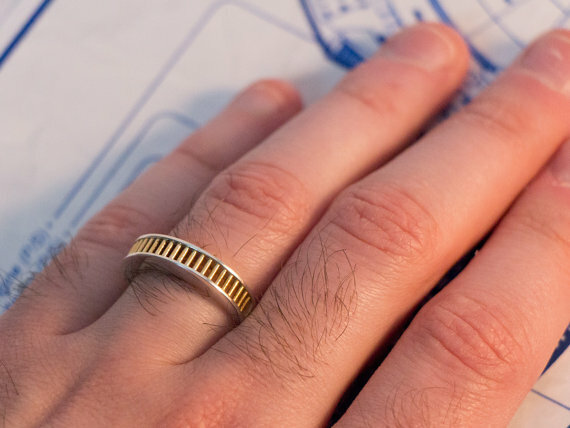 Whether you are a Portal fan or not, the pictures are still worth checking out if you are curious how rings like this are made. 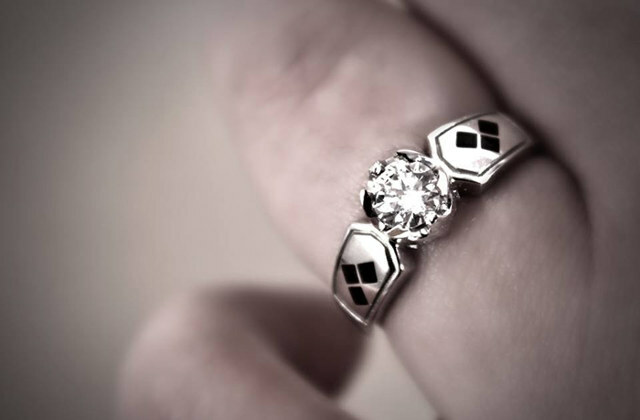 The cake might be a lie, but this Companion Cube engagement ring isn’t!